Tablets appeared in various iterations, used with styluses and buttons in The Original Series, and touch-sensitive buttons below a screen in Next Generation. Tablet computers are currently widely available in the US, and for the sake of ease we'll compare an iPad Mini to Star Trek personal access display devices, known as PADDs. Image Owners/Creators: Paramount Pictures and/or CBS. Image on Left: Kirk is handed a tablet in the episode "Mirror, Mirror." Image on Right: LaForge takes apart a PADD in the episode "A Fistful of Datas." Image posted by Lava Lander at MemoryAlpha. In The Original Series, PADDs were large and the size of a clipboard. By Next Generation they had shrunk to be about the same size as an iPad Mini. The iPad battery life also holds up fairly well. At full charge, a PADD will last 16 hours, compared to the 10 hours an iPad is supposed to last. Both tablets accept voice commands, and can wirelessly communicate with larger computers. Next Generation PADDs have a few layers of internal circuits. The inside of an iPad is a lot sleeker by comparison, and appears to have far fewer pieces. There are two major deficiencies that iPads suffer from: Star Trek tablets can survive a 35m drop (iPads barely survive a 1 meter drop if you're lucky), and Star Trek had the luxury of making up their own units of computer memory. PADDs hold 4.3 kiloquads of data, which is approximately 1.4x1089 TB of data compared to an iPad's 16 GB. Computers are obviously visually different than they were in the 1960s and 1990s. One major difference between Star Trek and modern computers is how they appear to store data. In The Original Series data seemed to be stored on cards in some capacity, about the size of a 3.5" floppy disk. Image Owner/Creator: Paramount Pictures and/or CBS. 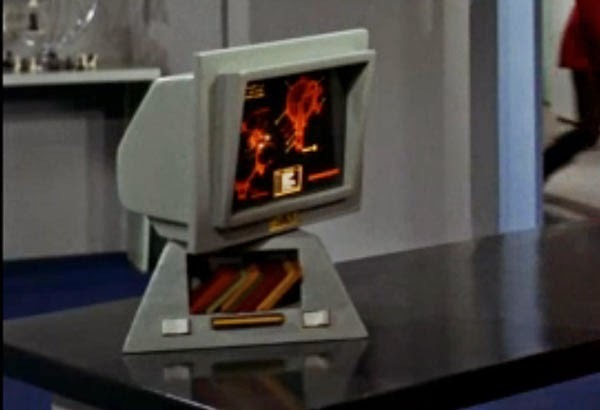 Computer display and memory disks (below the monitor) from "The Trouble with Tribbles." By Next Generation, they had moved to "isolinear" chips, which use nanoprocessors that transmit data faster than the speed of light. In reality we can't make anything travel faster than the speed of light, so current technology is at a disadvantage from the beginning. But, while we can't hold all that information on a disk, we can store it in the cloud. 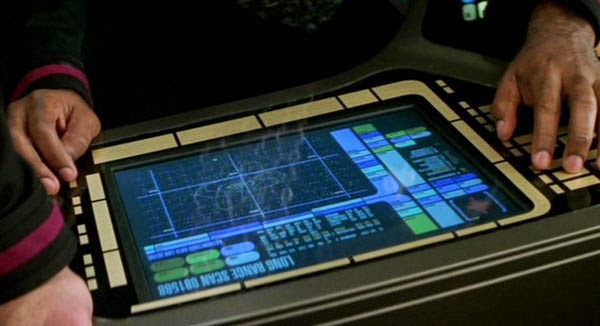 While Next Generation's computer seemed capable of wireless data transfer, tricorders and PADDs seem to use chips as their primary method of data storage. Each chip is capable of storing approximately 5x1089 TB of data, with various pieces of technology using multiple chips. In comparison, if each of Google Drive's 190 million users all purchased 30 TB of storage, we would still only get to 5.7x109 TB of storage. So, while we're moving away from storing data on disks, we haven't reached nearly the same memory capacity as a Star Trek chip. Used to administer medicine without needles, this is a technology we've developed and eschewed. Jet injectors used high pressure jets of air to deliver (mostly) vaccines. However, when they broke the skin there was the possibility of blood contaminating the device. It doesn't take very much blood to spread some infections, so jet injectors fell out of use. In 2012, MIT announced a new kind of needle-free device, but it isn't clear if it overcomes the problem jet injectors might have had spreading infections. The Universal Translator in Star Trek is more advanced than the technology we have - taking in an audio transmission and re-broadcasting it in a chosen language. But the technology we have that the Universal Translator seems to lack is visual translations. Google purchased the app Word Lens earlier in 2014, and it's available for iOS and Androids. It's a point-and-shoot application that does a passable job translating words in other languages. Lastly, I wanted to say that I wouldn't add communicators to this list of technology we currently do better. While it might seem obvious that smartphones have more functionality than communicators, the best modern-day approximation of a communicator is likely a satellite phone. Current smartphones rely on cellphone towers to transmit audio calls, and can only transmit a few dozen miles. Next Generation communicators have a range of around 500km (over 300 miles), which would easily reach the International Space Station in orbit. So, while we do have satellite phones that can transmit over a distance, they aren't nearly as reliable as communicators, and certainly don't have the same high-accuracy geolocation capabilities communicators provide. You are leaving out the most fascinating device ( I think ) from all of the Star Trek shows. I wanted to focus on the technology we have that's better than Star Trek and transporters (and tricorders, holodecks, and warp drives) are all interesting - and tech we unfortunately don't have yet. Umm, how about medical tricorders, holodecks, and warp drive? We don't really have those yet, at least not anywhere as good as STNG. In reference to the Universal Translator advancement Skype Translator due out at the end of this year is supposed to have near real-time voice translation with a high degree of accuracy in translation.